He was born in Beliatore, Bankura District, West Bengal. ? 1921- 24 Began his First period of experimentation with the Santhal Dance. ? 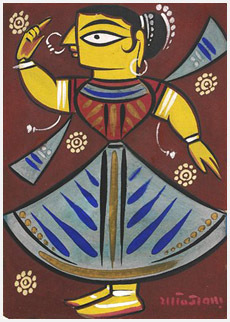 1925 Began experimenting along the lines of popular bazaar paintings sold outside the Kalighat temple, Calcutta. 1930-38 Diploma (Fine Arts), Govt. School of Art, Calcutta. Indian Museum, Calcutta. ? Parshant Tulsiyan, Calcutta. ? Chitrakoot Art Gallery, Calcutta. ? Prakash & Soumitra Kejriwal, Calcutta. ? National Gallery of Modern Art, New Delhi. ? Lalit Kala Academy, New Delhi. ? Kamal Morarka, Bombay. ? Abhishek Poddar, Bangalore. ? Victoria & Albert Museum, London. ? Delhi Art Gallery, New Delhi. 1935 Awarded Viceroy?s Gold Medal. ? 1955 Awarded Padma Bhushan, Govt. of India. ? 1956 Elected Fellow, Lalit Kala Akademi, New Delhi. ? 1967 Awarded honorary D. Litt., Rabindra Bharati University, Calcutta. 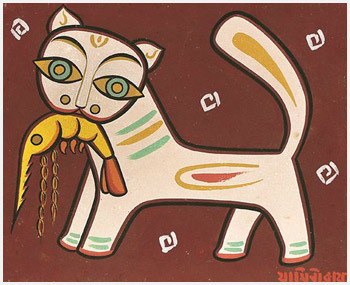 His art is associated specifically with Bengal modernism, replete with reference to the regions crafts and village arts, it also inhabits a crutial niche within the larger national arts spectrum. Fashioning a new `folk` style drawing on local art forms, it stands out in this period as a singular example of Indian Primitivism and the bearer of a new left cultural ideology.